After being closed since May, 2008, through operations on the ex-SP Siskiyou Route between Black Butte and Medford, Oregon over Siskiyou Pass resumed in early November, 2015. 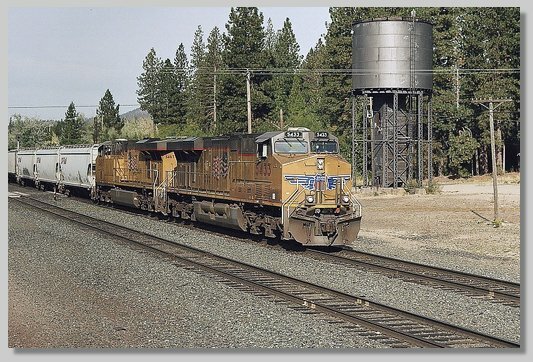 Current operations are normally five trains per week (Monday-Friday) departing around 8am from CORP's yard area near downtown Weed, not Black Butte. The train usually meets a southbound out of Medford, swaps crews and locomotives at Hornbrook and continues. CORP operates a sporadic switch job between Weed and Black Butte for interchange with UP. MRVHK The "Roseville to Hinkle" mainly hauls empties, via Portland, back to Hinkle Yard in eastern Oregon. Has a "Canadian" look, many of those cars continue on to Calgary. At times on some days this train continues on past Hinkle running as the MRVET (Roseville-Eastport, ID) but this has not been common recently. It usually gets out of Roseville in the 1-3am timeframe putting it through Black Butte mid/late morning the same days. MRVPT A Roseville to Portland (Portland Terminal's Lake Yard) general manifest freight. It generally leaves Roseville late afternoon and is through Black Butte after midnight, sometimes going into the hole at or near Black Butte for the southbound Coast Starlight. MRVPW A Roseville to Eugene mixed freight. This is a "road local" that often works at Anderson, CA and Klamath Falls, OR and occasionally at Black Butte when there is interchange traffic with CORP. It has sections for CORP, P&W, Coos Bay and local traffic in Eugene. ZLCBR The "Los Angeles (LATC Yard) to Portland (Brooklyn Yard)" hotshot usually runs six days a week (x Sunday night) and is often through Black Butte in the early evening (except Mondays). Mostly piggybacks, containers on flat cars, and some double stacks, usually up front and on the rear. ZLCTM The Los Angeles to Tacoma, WA doublestack container train. Operates three times a week, usually through Black Butte mid to late morning Tues-Thurs-Sa. This train works Stockton and Portland/Brooklyn Yard on its way north. All 53' containers, no piggybacks. MHKRV This is the "Canadian Pacific" train, mostly loads of wood, grain, and other products coming down from Canada via UP's Hinkle Yard in eastern Oregon. It terminates at Roseville where the cars are humped and then sent to various destinations. 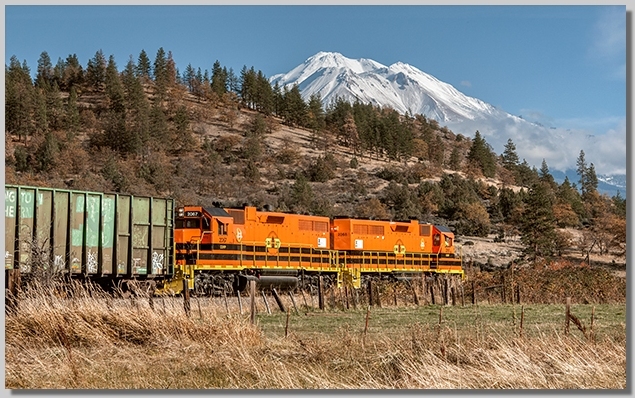 This is often a mid to late morning train through Black Butte. It often, but not always, has DPUs. MPDRV This is one of several Portland to Roseville mixed freights that pass through Black Butte. It often has DPUs. MRVPDB This second section of the MPDRV has become a regular Portland/Albina Yard to Roseville train as of mid-2013. MPWRV This train is handed off to UP by the Portland and Western RR and goes to Roseville. This train is often through Black Butte late at night. ZBRLA This is the "Brooklyn Yard (Portland) to Los Angeles (LATC Yard)" hotshot with mostly piggyback and COFC (containers on flat cars). The "Brooklyn" is usually through Black Butte mid-morning. Runs daily except Monday morning. In addition to these listed trains, UP also operates occasional "repo" trains (empty intermodal equipment) both directions and the sporadic northbound autorack train. Other special trains (military, unit grain, maintenance of way) also operate at times. 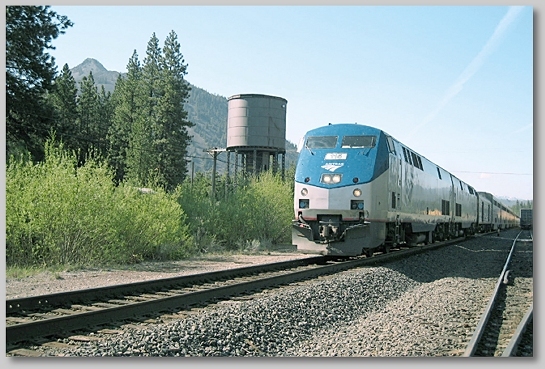 #14 "Coast Starlight" Amtrak's premier Los Angeles to Seattle west coast train passes through Black Butte around 6am. #11 "Coast Starlight" If on time, the southbound Starlight passes through Black Butte shortly before midnight.